Now that’s chill! 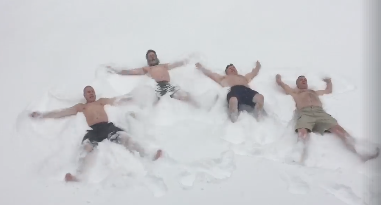 Stephen Grether challenges those whose loved ones lost a battle with cancer, as some of his have, to jump into a pile of snow wearing just a swimsuit and make an angel to raise money for hospice. He convinced three pals to do just that, and gave the $260 to IAHPC; in our view, they are truly angelic! Watch these angels linger in the snow for an extra few playful seconds — and listen to them squealing! — in the video that Stephen posted to Facebook. Anyone else game to try? We are very grateful to the individuals and organizations that have donated to support our mission. When you donate to IAHPC, your money goes into a revolving fund to support program development and membership from developing countries. If you would like to support our work please donate here. IAHPC is a charitable organization so donations to the organization are tax deductible. A copy of the IRS 501(c) 3 determination letter is available upon request from IAHPC. You can also help IAHPC when you shop at Amazon at no additional cost to you! By listing the International Association of Hospice and Palliative Care as your chosen charity in the AmazonSmile program (click to ‘your account’ and select AmazonSmile), Amazon will donate 0.5% of eligible purchases to IAHPC. Do you have any questions about regarding last month's donations?